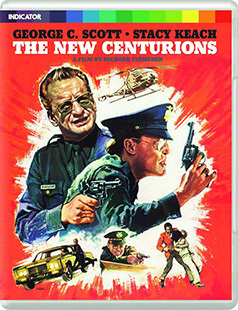 George C. Scott and Stacy Keach star in THE NEW CENTURIONS, Richard Fleischer's 1972 film adaptation of detective turned author Joseph Wambaugh's first police novel. Slarek is still a little divided on its merits, but there's good stuff here, and it's well served by Indicator's new dual format release. Back in the early 1980s, a ground-breaking American series titled Hill Street Blues hit British TV screens. You may have heard of it. If you're old enough, there's a good chance you watched it. At the time, it really did feel like something new and gave the impression that you were seeing police work as it really was. I was a big fan. My girlfriend at the time was less impressed. "These guys go out and harass and beat on people all day and I'm supposed to care about their domestic problems when they get home?" she complained after watching a single episode. I thought this a little extreme, given that the series went out of its way to include all aspects of American policing and its problems, from the well-intentioned humanist detective to the corrupt and feckless drunks and addicts, along with just about everything between. A few years later, having been exposed to footage of the Rodney King beating and a host of other revelations about police brutality and racism, I could at least understand where she was coming from. But I remained captivated by Hill Street Blues and only later discovered that it had a notable televisual forebear in the shape of the 1973 Police Story, which is generally credited as the first American police series to realistically explore the day-to-day experience of both plain clothes detectives and patrol officers, and one that did not paint its characters in – if you'll excuse the vehicular police reference – purely black and white terms. This earlier series was the brainchild of policeman turned author Joseph Wambaugh, who two years earlier, while still working as a detective for the Los Angeles Police Department, published his first and most autobiographical novel, The New Centurions. The following year, it was made into a film directed by B-movie maestro Richard Fleischer and starring George C. Scott and Stacey Keach. Following a title sequence montage of Police Academy training and graduation, three rookie graduates find themselves posted to the same East Los Angeles precinct, where each are paired with more experienced partners. Bookish Gus Plebesly (Scott Wilson) is teamed with cigar-chewing Whitey Duncan (Clifton James), Hispanic Sergio Duran (Erik Estrada, later to hit the big time as Officer Frank Poncherello in CHiPs) with the easy-going Galloway (an underused Ed Lauter), and Roy Fehler (Stacy Keach) with 35-year veteran Andy Kilvinsky (George C. Scott). Wambaugh's novel divided its length evenly between all three rookies, exploring how each of them learns to cope with, or falls victim to, the pressures and stresses of police work, and what they learn from their more experienced partners. Initially, the film seems to be following the book's lead, switching between the three crews as they spend their first nights on patrol and chatting with their partners in a manner that allows us to learn a little about each of the recruits. All three are revealed to have joined up partly for financial reasons: Plebesly has a wife and three kids to support, but now wants to be the best policemen he can; Fehler also has a dependent wife and a child, but has saddled himself with the additional burden of paying his way through college with the eventual aim of going to law school; and Duran sees the job as an escape route from the poverty and gangland violence of the streets where he was raised, so is less than delighted to have been stationed back in the very same district. It quickly becomes clear, however, that Plebesly and Duran are going to be side-lined in order to focus on Fehler, the only one of the three whom we follow to his home. While this helps to humanise Fehler and flesh out his character – we soon discover that he's failing the college courses to which he's paying scant attention and that his passion for the job is putting a stain on his marriage – it does tend to short-change the others, whose stories are worthy of a lot more screen time than they are afforded here. This is particularly true of Plebesly, who, after responding to a call regarding a store robbery, inadvertently shoots and kills the owner when he mistakes him for the perpetrator. The incident leaves Plebesly emotionally shaken and the target of angry despair from the man's distraught son, but beyond a brief "I'd have done the same" pep talk from Duncan, the personal and professional consequences are never explored, and the shooting itself is afforded no further coverage. Fehler and Kilvinsky and the growing bond between them prove to be the bedrock of the film's first half, though even this would have benefitted from the sort of expansion that only serialised TV can really afford. There is thus a sense here that we're only getting the edited highlights, as the story unfolds as a series of almost invisible temporal jumps with no clear indication of how much time has passed between each, and we're left to fill in the narrative gaps. Thus when Fehler gets home late from his first day on the job and tells his wife Dorothy about Kilvinsky, she immediately suggests they invite him round for dinner, and while this never happens within the framework of film, we can assume that it did at some point from the first-name familiarity between Dorothy and Kilvinsky at a later moment of crisis. It's also this that accounts for a seemingly swift increase in confidence on Fehler's part, one that sees him go from questioning the legality of picking up a suspect who doesn't match the exact supplied description to persuading a man with six warrants to his name to get into their patrol car by intimating that he'll need an ambulance unless he quickly does so. We also learn a few things about old hand Kilvinsky, from the personal coda – or "Kilvinsky's Laws" – that he shares with Fehler on their first night on patrol, to his deep apprehension at the very prospect of retirement, something that's written all over George C. Scott's subtly expressive features. And Kilvinsky does appear to live by his self-drafted laws, rounding up prostitutes and running them around the block a few times with a bottle of scotch to keep them off the street for a night without booking them, and furiously threatening a racist slum landlord who is extorting a family of hard-working Mexican immigrants. The problem for any discussion about the direction that this mentor/pupil partnership later takes is that it involves story twists that should definitely not be revealed in advance, despite the fact that they deliver two of the film's most memorable scenes. The first of these is genuinely startling, while the second is so subtly handled that I was two viewings in before I realised that the whole sequence was captured in a single shot in which the camera glides slowly across the room from wide into extreme close-up. It's also these story turns and the effect that they have on the characters that illustrate what made Wambaugh's early novels felt so fresh in their day, that they didn't glamorise their characters or sugar-coat their flaws, being prepared instead to show that even the best-intentioned cops could make catastrophic mistakes or fall victim to addiction or the lure of corruption. And while the film doesn't shy away from these issues, it also doesn't get beneath the surface to explore them in any real depth, presenting us instead with observations of behaviour and an overview of some of the likely triggers. And focussed as it is almost exclusively on its predominantly white male police leads, the film spends next to no time on the impact of crime and its policing on the district's largely black and Hispanic community, or the socio-economic circumstances from which such criminality grows. There's little doubt that The New Centurions has been disadvantaged by the numerous quality cop shows that followed in its wake, shows whose series-length running times and large ensemble of characters enabled them to explore all of the issues touched on in Fleischer's movie and more besides, but in considerably greater detail and with more emotional and socio-political depth. And though I'm always loathed to make book-to-film comparisons, the material is all there in Wambaugh's novel for a richer, more complex look at what the author himself regards not as a portrait of how cops act on the streets but how the street acts on cops. Yet The New Centurions is still an important first step in what would later grow into a popular film and television sub-genre, and it remains an intriguing social barometer of its time. Not that this always makes for comfortable viewing, as evidenced by the scene in which Fehler transfers to Vice and is involved in a sting to entrap and arrest a 'fruit' (homosexuality was still criminalised in the US in 1972), although full marks for making their target so tough that it takes the whole squad to subdue and arrest him. More progressive is the relationship that Fehler strikes up with black burglary victim Lorrie (an excellent Rosalind Cash), an interracial romance that is not shown to be in any way unusual or controversial, but which apparently had conservative studio execs in a reactionary tizzy until Wambaugh himself stepped in and refused to allow this element of his novel to be changed. And there is much to enjoy and even applaud here, in the handling of individual scenes (a sequence in which Fehler hangs on to the side of a car for dear life as it speeds through traffic is genuinely hair-raising) and especially in the performances. A quietly commanding George C. Scott leads the pack so completely that you genuinely miss him when he's not on screen, a young Stacey Keach keeps it engagingly low-key as Fehler, and several of the supporting roles have a nicely authentic ring, while as Whitey Duncan, the hugely likeable Clifton James is charged with delivering the sort of lighter character moments that would become a de rigueur component of later cop shows and films. Not all of them work. The scene in which he settles a dispute between an argumentative couple by pretending to divorce them is clearly meant to be funnier than it is, but a later sequence in which he is questioned by his sergeant about the food stains on his tie is an absolute hoot, thanks largely to James' straight-laced delivery of screenwriter Stirling Silliphant's witty dialogue, a rare example of a sequence that plays even better in the film than it did in the source novel. And twice the film foreshadows the aforementioned Hill Street Blues, first by kicking off with a start-of-shift roll-call, something that quickly became a signature of the TV series, and later with the appearance of Vice Squad officer Sgt. Anders, who is played by actor James Sikking in what almost looks like a dry run for his career-defining role as Hill Street Station's Emergency Action Team leader Howard Hunter, complete with pipe and self-confidently officious air. Sourced from a high definition remaster supervised by James Owsley, the 2.35:1 transfer here is in generally fine shape, albeit with a couple of small caveats. Sharpness and image detail are strong, and while the contrast is for the most part nicely balanced, the solid blacks in some of the darker scenes – think black-dressed patrolmen in a darkened patrol car at night – do tend to pull in some of the surrounding detail. Crucially, however, their faces are always clearly exposed. Some of the interiors have a gritty feel and the colour is often muted and earthy, all of which I'm willing to bet was intentional (it certainly feels right for the film's chosen aesthetic), but when bright colours do put in an appearance, they're richly reproduced. Occasionally the black levels do soften a little, and in the sequence in which Fehler intimidates an uncooperative offender into the police car by pretending to call an ambulance, a couple of the shots are spectacularly glum looking. But these are rare, and for the most part the image is in fine shape and as clean of dust and damage as you would expect. The Linear PCM 2.0 mono track is clear, clean of any obvious blights and boasts a decent dynamic range, albeit with a slight treble bias. You can also dial up optional English subtitles for the deaf and hearing impaired. I always let loose an expectant smile when I click on a title in a disc's special features and the Fiction Factory introduction unfolds. As ever, this look back at the making of The New Centurions is built around interviews with a cooperative few of those involved in its making. Handily, these include author Joseph Wambaugh, his former partner and the film's technical advisor Richard E. Kalk, and leading man Stacy Keach. Wambaugh in particular is bristling with interesting memories, recalling how he began writing short stories and how his early novels made him famous enough for his colleagues to start treating him almost reverentially, which eventually prompted him to leave the force and work full time on his writing. Keach reveals that he, Scott Wilson and Erik Estrada spent two weeks at Police Academy in preparation for shooting, and first assistant camera Ronald Vidor sings the praises of director of photography Ralph Woolsey and talks about some of the film's more complex shots. There's loads more here, some of it involving serious spoilers, a warning about which has been thoughtfully placed at the very start. A not too appealing trailer comprised largely of action with the couple of conversational inserts and no real sense of flow. Fancy watching The New Centurions in low resolution, cropped to 4:3 and cut down from 103 minutes to a brisk 17? Well, you're in luck. Younger viewers may wonder what the hell this is all about, and even I needed a memory jog from Camus, who still has a small collection of these intriguing and probably now highly collectable shrunken features. Before VHS video came along and made it possible to watch movies at home on your TV whenever the hell you liked, some companies were making films available on 8mm film. Occasionally you could get your hands on the whole film (I remember seeing Scars of Dracula for the first time on this format), but more often than not they were made available in a severely compressed form where the basics of the story were outlined by stringing a few key scenes together, many of which were also shortened from their original length. The result tended to play like an extended trailer for the film, albeit one that includes the ending (or not, in the case of the 8mm Alien). The same is true of the one for The New Centurions, which still sports some damage but is otherwise quite watchable, but does make you realise how important all those scenes that it dispenses with are to the story and character arcs. 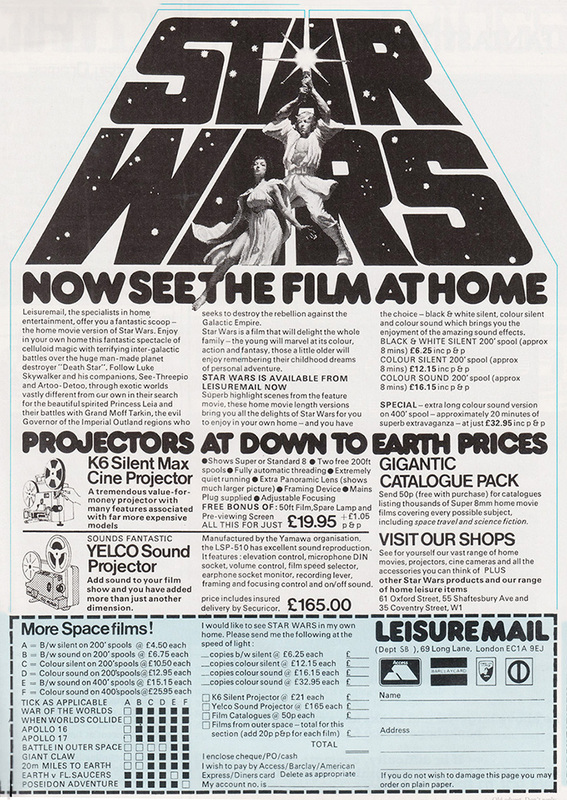 As a little extra for those for whom this is all new, Camus has unearthed a full page ad for the 8mm version of Star Wars and the equipment you needed to screen it from an early edition of Starburst magazine. Enjoy! The always welcome Booklet kicks off with a fine new essay on the film and television representations of the Los Angeles Police Department by Nick Pinkerton. This is followed by a useful round-up of contemporary critical responses to the book (all good) and the film (somewhat less so), and a reproduction of the film's production notes. Credits and plenty of production stills have also been included. There's also a small piece on the correct spelling of 'Kilvinski' (you'll understand why when you read it). Three viewings in and I still can't completely make up my mind about The New Centurions. It's enjoyable enough and certainly well-intentioned, but I was repeatedly left with the sense that we're only getting half the film it could have been. Comparing it to other Joseph Wambaugh adaptations, it's better than The Choirboys, but not as good as The Blue Knight or The Onion Field. Yet it's absolutely worth seeing, particularly for fans of the series and films that it paved the way for. A very decent transfer and a couple of excellent extra features make this another solid release for the Indicator label.